creates her most provocative and magical spellbinder yet in this gothic novel set against the lavish spectacle of 1890s Belle Époque Paris. What I Say....This book was a wild ride. 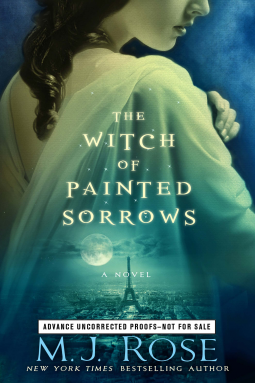 Set in the late 1800's in beautiful, but dark Paris, Sandrine has fled America to escape her brutal husband. She arrives at her courtesan grandmother's house to find it closed up and her grandmother living in a lavish apartment, and not too happy to receive a runaway granddaughter. Not because she doesn't love her granddaughter, but because she is fearful for Sandrine if she is in Paris. And then her adventure begins. She discovers that she is suddenly a talented painter, when previously she had failed, she finds passion with Julien, when she had always thought of herself as frigid, and she finds the confidence to pursue what she wants, whether it's admission to a male only art school or another woman's fiance. This was a great mix of a gothic love story, mixed with a ghost story. The only word for the writing was lush. The ghost story was scary, the love story was passionate, and reading it made you felt like you were in the dark, slightly sinister Paris of the 1800's. I will say the ending was a bit of a kicker for me. I wasn't expecting that, and at first I was taken aback, but then I decided it's nice when you don't have the typical ending. Thank you to NetGalley and Atria books for giving me this ARC for review.